University has collaborated with various institutes and reputed companies for the better placement opportunities .University has placement cell which is the backbone of institute which offers best training and counseling for the candidates. 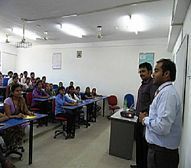 The placement cell conducts seminars in which reputed companies visit the college and interact with the aspired candidates and give a brief introduction about the needs & requirements of industry so that students can understands the industry standards and training team also provide industry oriented education for the candidates . Write Your Reviews on "Rai Technology University"
Are you Interested in "Rai Technology University"? Please provide the following details. Ask Question on "Rai Technology University"?